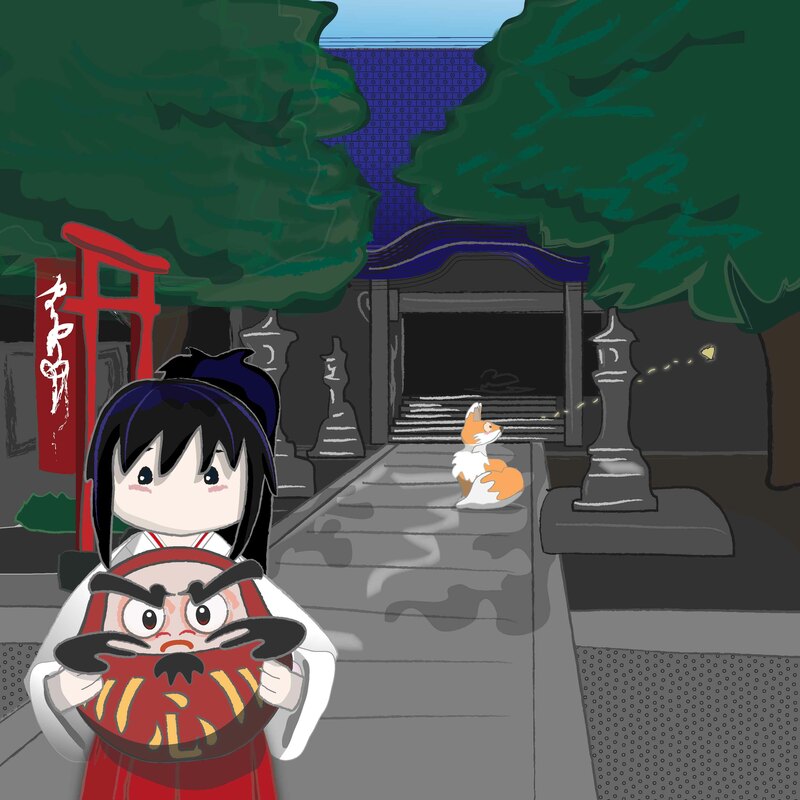 Kiku the fox and his best friend Miko decided to visit Kishibojin temple (also called Kishimojin), and see what old-fashioned style candy they could try. 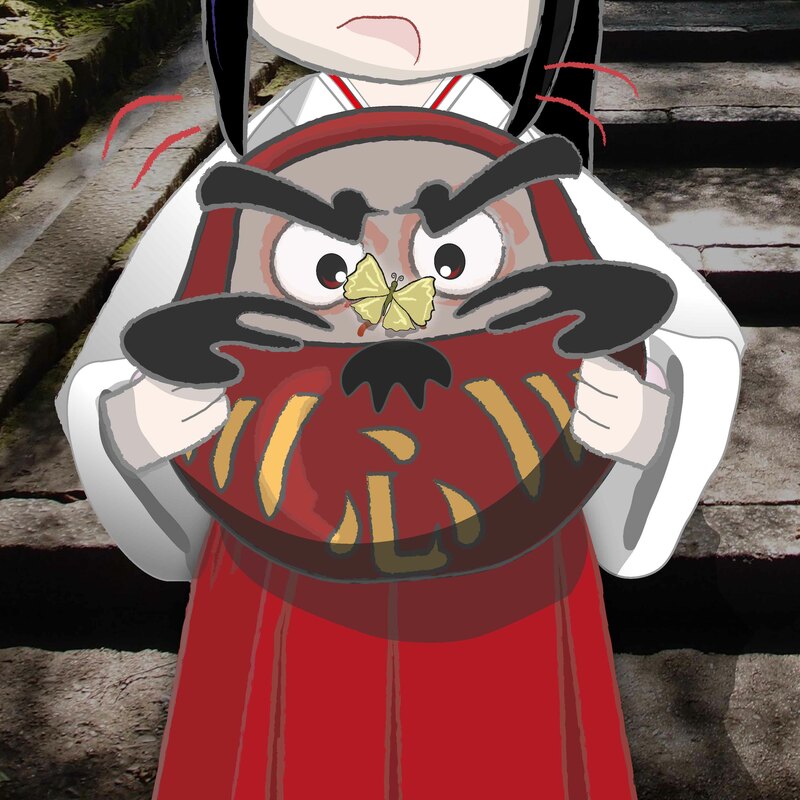 Miko-chan asked if she could bring DokiDoki Daruma, the grumpy little doll they had found at the Daruma market in March. “He is so grumpy, and this heat isn’t helping – perhaps a change of scenery will do him good?”. 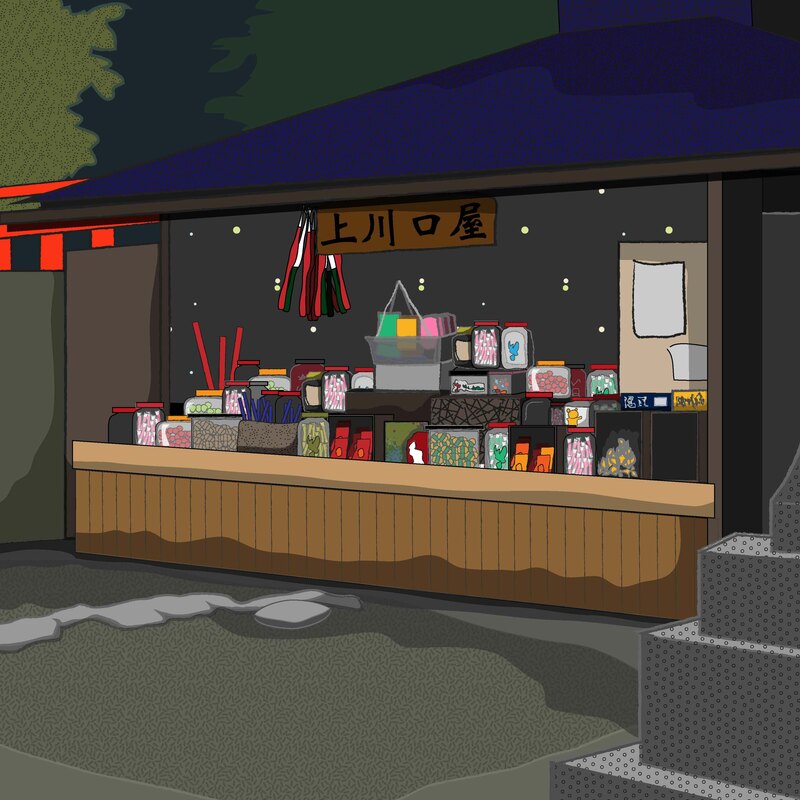 When they arrived at the temple, they saw the large kiosk style building just outside the main temple hall, piled high with many sweets they had not encountered before. They decided to take a little walk with DokiDoki around the temple grounds before taking some sweets home to the bathhouse to try. Kiku noticed a yellow butterfly fluttering in and out of the trees, and pointed it out to Miko-chan, who was carrying the daruma doll in her arms. As she turned to look, the butterfly flew past the little fox, and landed on the centre of the daruma doll’s unhappy face. 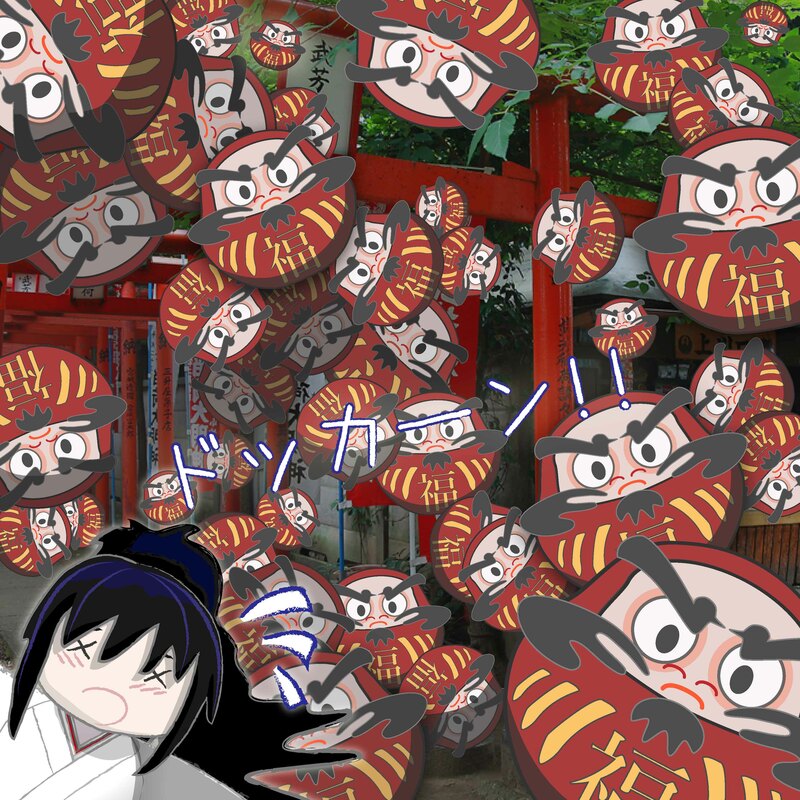 When this particular daruma doll gets upset or over excited, he becomes extremely agitated, making a rapid heartbeat sound, which grows louder and louder. This sound is known as ‘doki doki’ in Japan, hence his name. Once the sound has become deafening, he explodes into many hundreds of similar looking dolls, as a way of protecting himself from anything and everything…. 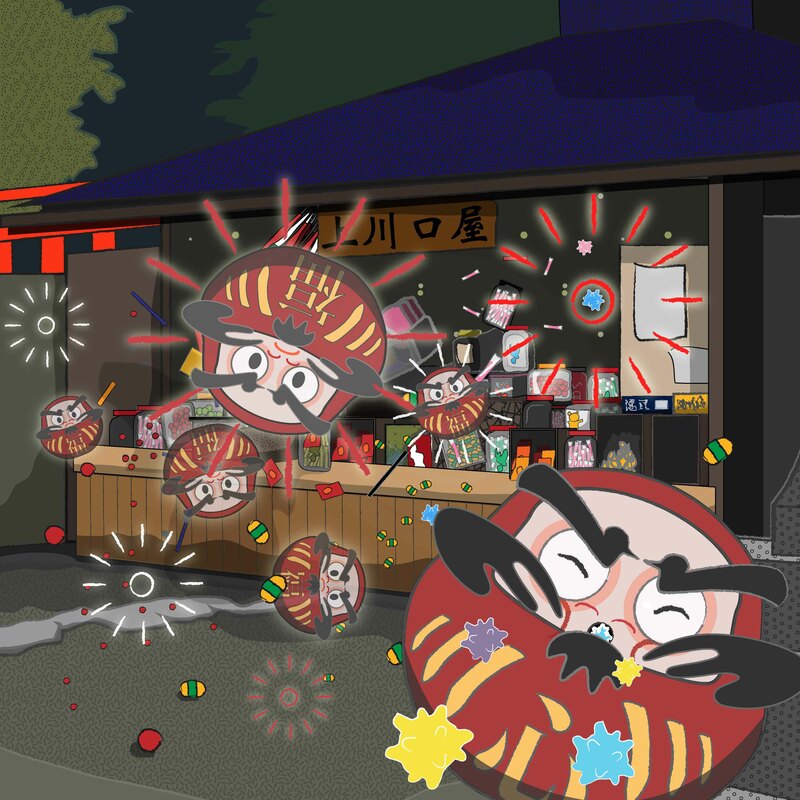 DokiDoki Daruma has a different Japanese character on his belly than the one on the many copies he makes. 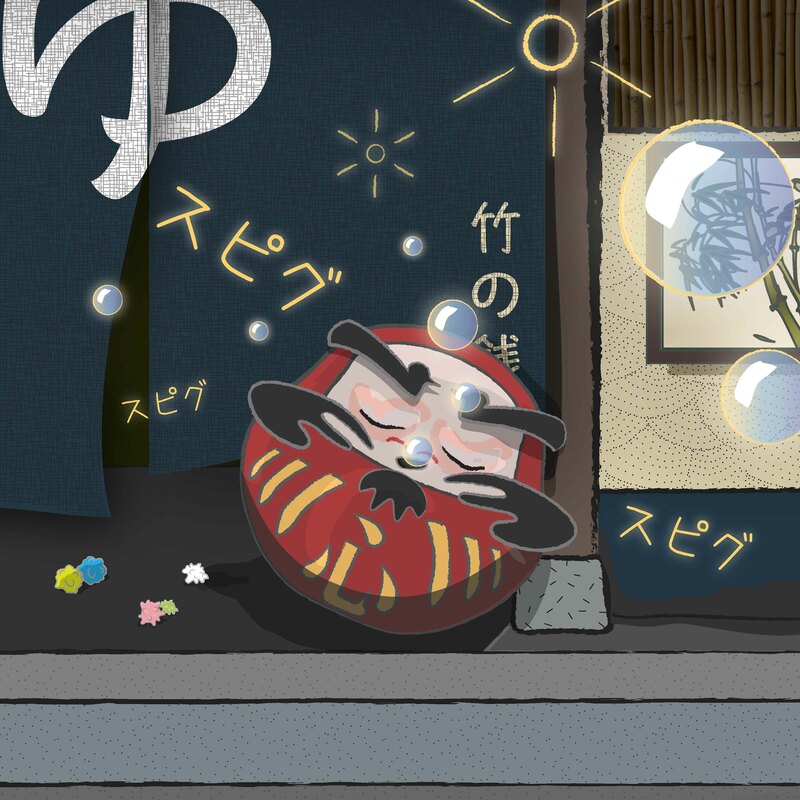 They all have the character 福, ‘fuku’ which means ‘good fortune’, whereas DokiDoki has the character 心 on his belly (pronounced ‘kokoro’), meaning ‘mood, spirit, emotions, heart’ and which describes this very sensitive daruma doll perfectly. Can you find him in the picture below? The little spiky hard candies were konpeitou (金平糖, コンペイトー), a small star candy, whose name comes from the Portuguese word ‘comfeito’ which is a type of hard candy made using refined sugar and brought to Japan by the Portuguese in the 1560’s. And so it was that the two friends found by having some of these star candies handy, you could calm DokiDoki Daruma down, and maybe even prevent an explosion. 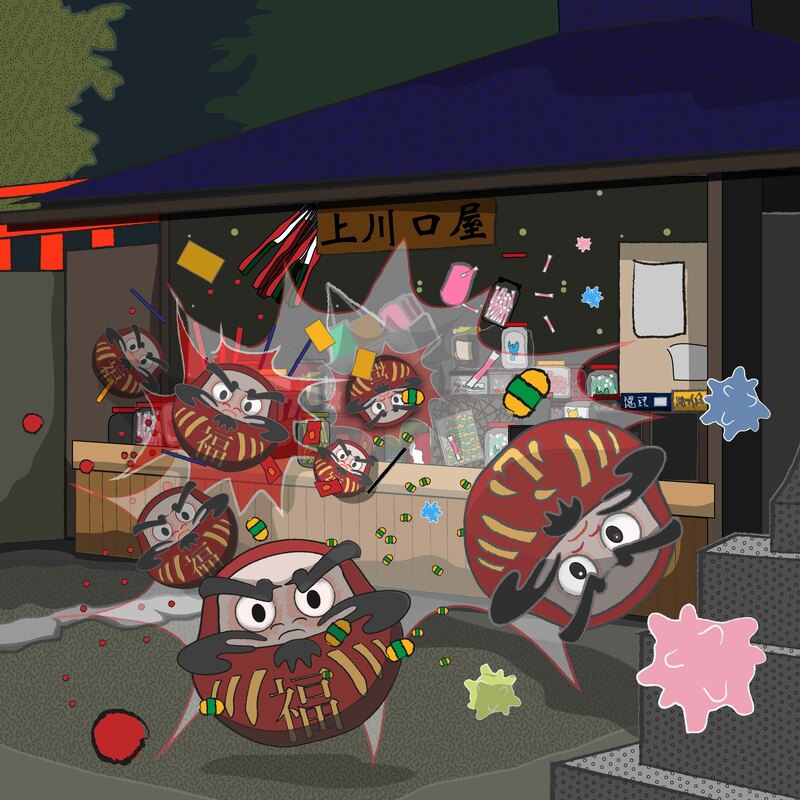 After eating the candies by accident, DokiDoki fell into a deep and peaceful sleep, and could be heard making the sound ‘スピグ’ (‘supigu’, which is another onomatopoeic Japanese word, representing a soft whistling sound made during peaceful sleep). Miko was able to carry him home on the train without waking him, and she left him sleeping off the excitement on the front step of the Bamboo Bathhouse.